Amazon’s new brand page experiences take advantage of Facebook’s Interface Framework! As Amazon’s 3rd party merchant network continues to grow, its nice to see they also continue building tools for brands and vendors in their network! I run Growth and Business Development at an Amazon Manufacturers Representative Agency which means we focus on eCommerce accounts, specifically Amazon.com, Walmart.com, Homedepot.com, Wayfair , etc. In the early days it was an excellent experience to become an Amazon Vendor partner. They’re leading edge and offer a huge opportunity for growth(they still do). More recently Amazon has built a little bit of a thick skin and turned a corner knowing that they run the vertical. Its common for vendors to feel bullied or left in the dark because they cannot get a response from vendor managers, their catalog data is not being updated, their price corrections are not being accepted. Today is a new day where Amazon is putting the vendor first and creating “brand pages” that specifically let brands create a unique experience on the Amazon site. It was pretty delightful to see that Amazon is utilizing the framework created by Facebook, given the hostile environment around Facebook’s license choices for React and Open-Source. Just a few days ago the Apache foundation publicly denounced using Facebook Open-Source on their projects because of its license. Want to check for yourself? 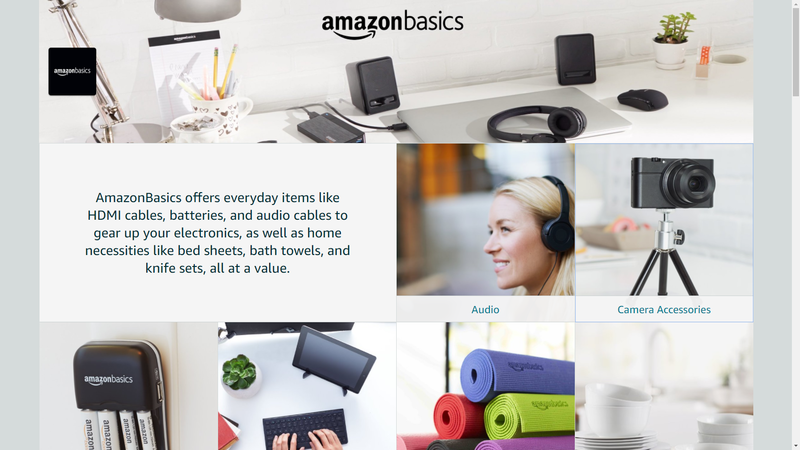 Open the Amazon Basics Brand Store and Inspect the page! What are Amazon Stores? — With Amazon Stores, you can build a new shopping experience to showcase your brand and drive traffic to a unique Amazon web address. You can create multiple pages on your store for your product catalog, with mobile-friendly templates to add new products and tell a story about your brand. Am I eligible for Amazon Stores? — If you are a vendor, you are automatically eligible for Amazon Stores. Is there a charge to create an Amazon Store? — Creating an Amazon Store is free of charge to vendors. How do I build and maintain an Amazon Store? — You can create your Amazon Store using Store Builder, Amazon’s self-service brand store builder. Amazon Store Builder is available through ams.amazon.com. My Brand/Factory wants help selling to Amazon? Utilizing Amazon Store builder? If your team needs help with Amazon brand stores, please reach out and see if we can be a fit! If your Manufacturer’s Representatives aren’t familiar with analytics 📈 and SEO 💻 then you’re pretty much guaranteed to be under-performing 😁.